This little Gâteau Breton looks so simple and innocent but there’s a rich and buttery depth behind its golden crust that can easily compete with any lavish layer cake. I admire the sweet French cuisine for mastering the art of getting the most out of a piece of butter, a few eggs and some sugar and flour. 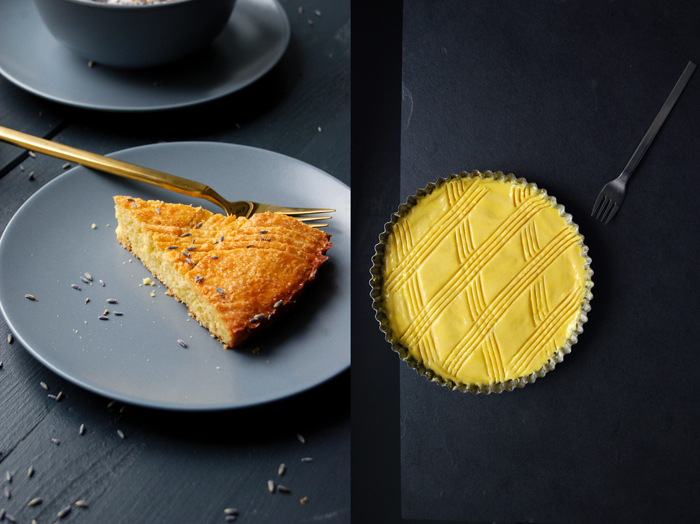 This is minimalism brought to perfection in baking. I chose this Brittany butter cake as it seemed the right recipe to try out my new homemade lavender sugar. A spongy shortbread, that’s how I would describe it, sprinkled with the most fragrant purple sugar, it sounded so good and it tasted even better. Frances Bissell, the woman behind the wonderful baking book The Floral Baker, is a genius mind responsible for many wonderful sweet and savoury creations refined with lavender, jasmine, rose petals, orange flower water, wild garlic or saffron. Her recipe collection is a journey through nature’s opulence, I felt so inspired by the way she introduces new flavours and offers fresh combinations that I had never heard of or thought about. I already decided that her Saffron and Rosewater Biscuits, Lavender and Tomato Tart and the Lavender White Chocolate Caramel Cake will soon make an appearance on my kitchen table! My first practical approach to her book was the preparation of lavender sugar. Frances suggests 10 parts sugar and 1 part lavender flowers (L. augustifolia, Hidcote), I trust this experienced baker so I decided to fill a huge jar up to the brim. 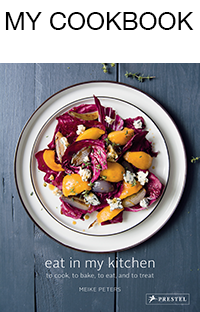 My new pantry project satisfied me instantly, every couple days, I took it off the shelf to shake my flowery treasure and imagined all the recipes it would refine in future. Pure relaxation in a jar! After a few weeks the time had come to give it a go and I think I couldn’t have had a better start to my flower project. I didn’t mix the sugar in in the dough, I just sprinkled the purple flowers and sugar on top of my warm Gâteau Breton and it instantly spread its beautiful aroma. 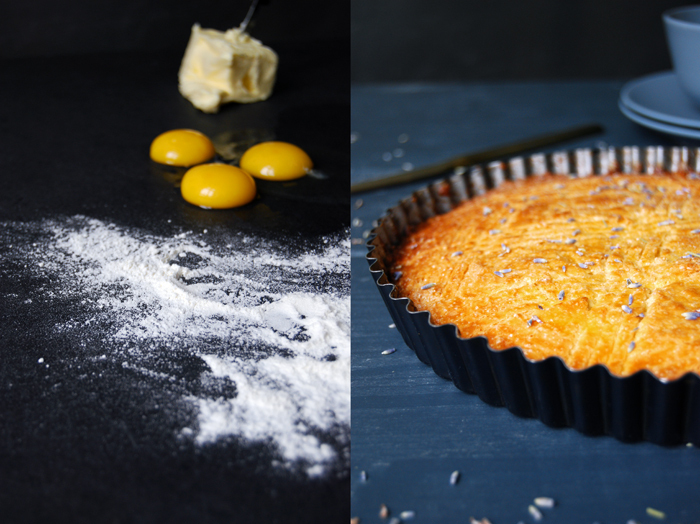 It looked stunning, it took a French baking classic to another level and my boyfriend, who isn’t usually too fond of lavender, couldn’t get enough of it (like me)! I’m with Diana Henry on The Floral Baker: ‘So thrilled with this by the wonderful Frances Bissell’! 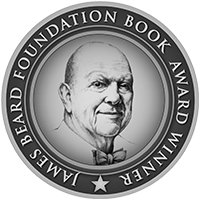 Thrilled and inspired, that’s the best a cookbook can do! 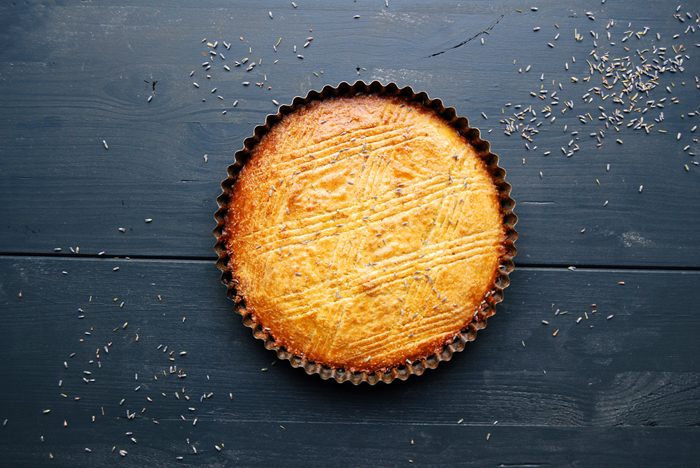 Mind that you prepare the lavender sugar a few days (or even weeks) in advance, 10 parts sugar and 1 part organic lavender flowers (L. augustifolia, Hidcote), you’ll only need a couple teaspoons for this cake. Set the oven to 170°C / 340°F (fan-assisted oven) and butter the tart pan. Combine the flour, baking powder and salt in a small bowl. In a large bowl, whisk the egg yolks, the egg and sugar until light and fluffy. Add the butter and mix with the hooks of your mixer, add the flour and continue mixing until combined. Scrape the dough into the tart pan (it will be sticky) and even out the surface a little. Whisk the egg yolk and water for the glaze and brush the top of the dough. Scratch a diamond pattern into the surface (as you can see in the pictures), mind that you scratch deep enough, otherwise the pattern will melt away while baking. 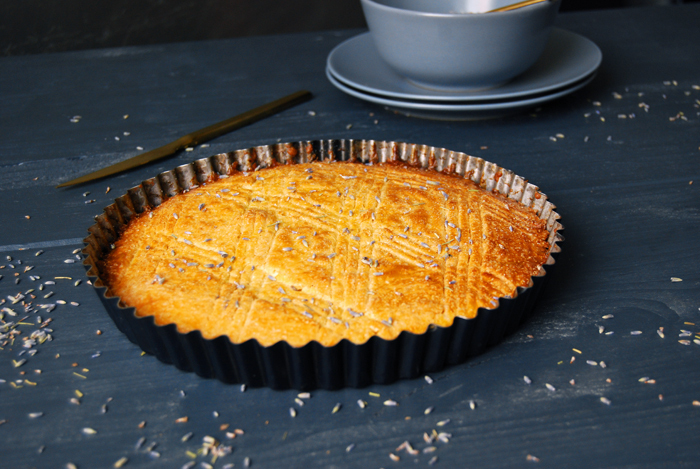 Sprinkle with a teaspoon of lavender sugar (without the flowers) and bake for 25-28 minutes or until golden. 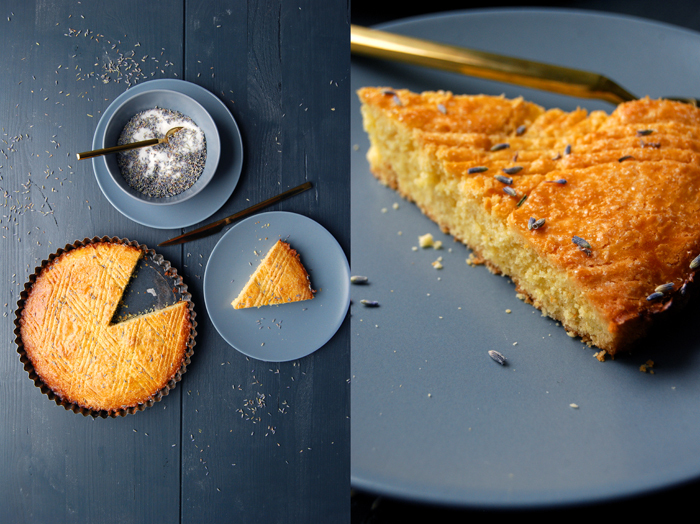 Sprinkle the warm cake with a little more lavender sugar (this time with the flowers as well). This is just beautiful! 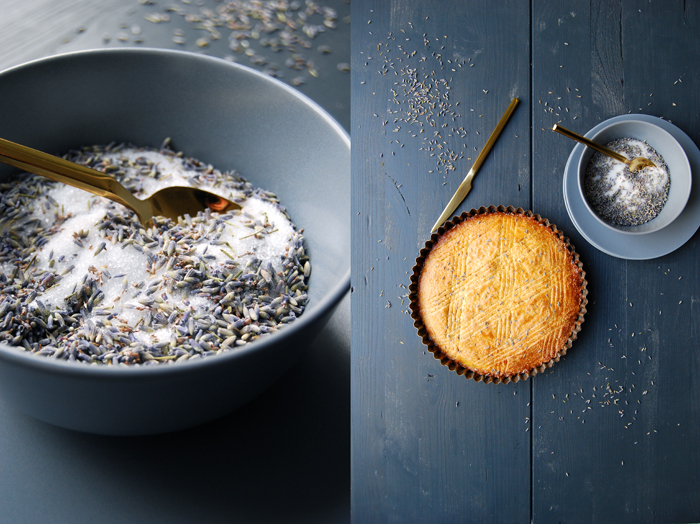 I love the addition of lavender – it can be so delicious if you use it in small quantities. I am the only one in the house that likes lavender flavored baked goods…but I am going to make this in the hopes hubby will help me eat it! Your photos are beautiful, as usual, Meike.